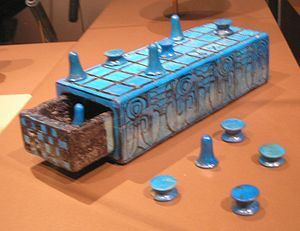 "Senet" is an ancient Egyptian board game and is said as the oldest board game in the world. There is nothing actual rule, although historians have made educated guesses. Senet historians Timothy Kendall and R.C. Bell have each proposed their own sets of rules to play the game. But their rules are both bored to play as board game for modern people. 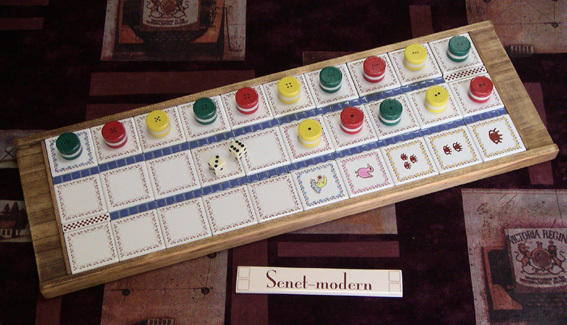 Senet and Senet-modern are almost looks same but Senet-modern rule is arranged more speedy, offensive and strategic. 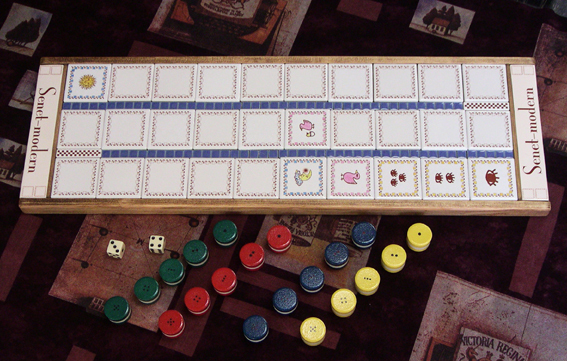 2 players move own 5 pieces due to dice number and be up the goal side. 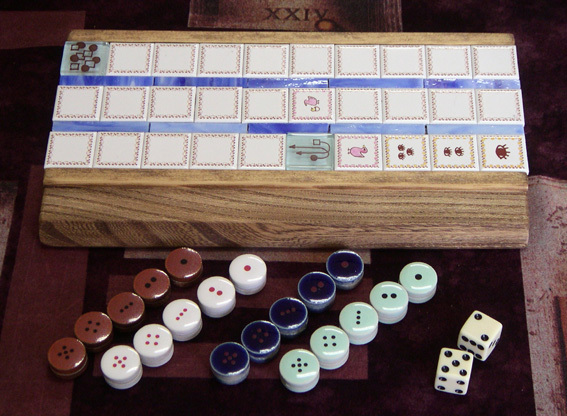 Difference is that "Senet-modern" pieces are printed different number's dots 1 to 5. Number is score. The winner is the player who get more score when 3 pieces are upped. 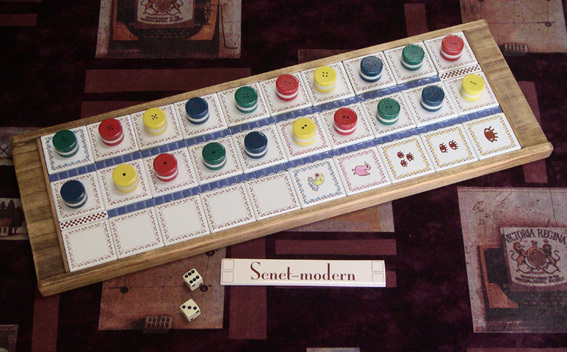 more information in japanese about Senet-modern. click here! 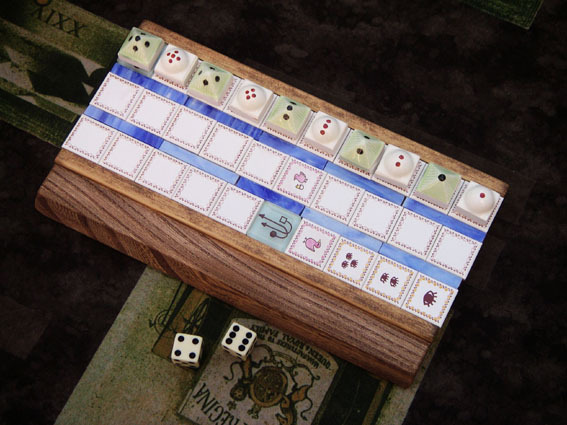 Object: To get more score when 3 pieces are upped. 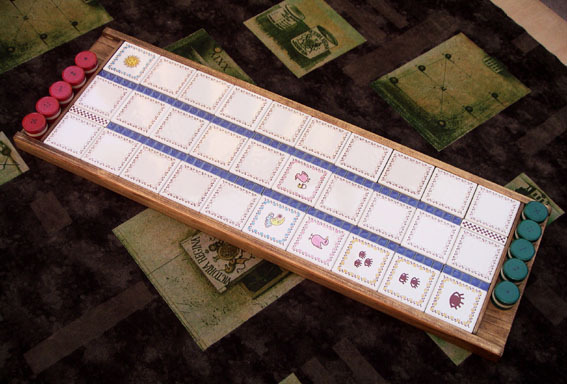 Board: 10by3lines = 30 squares tile board. The left upper tile (sun) is start side and right down tile is goal side. All pieces are moving on reversed S letter. 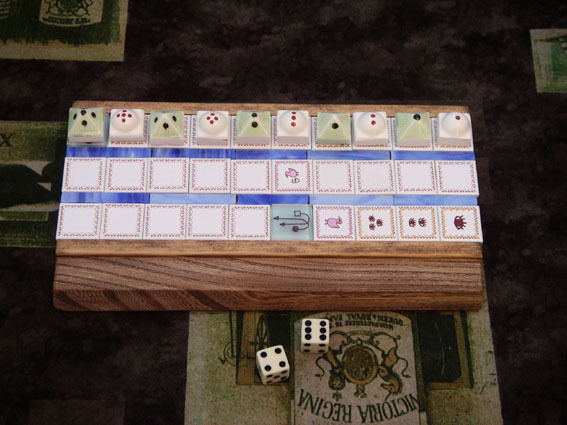 Pieces: Each Players have own 5 pieces and they are printed different number dots 1 to 5. 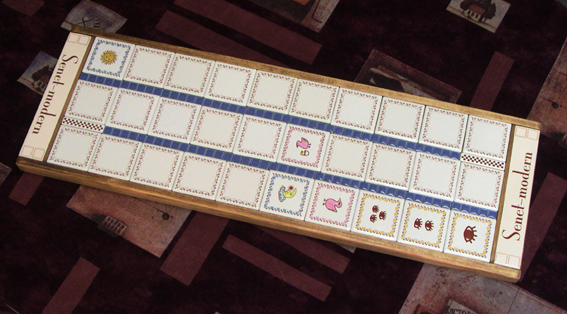 Starting position: Pieces are lined up from start tile (sun) 5,5,4,4,3,3,2,2,1,1 alternately. Take a turn alternately. 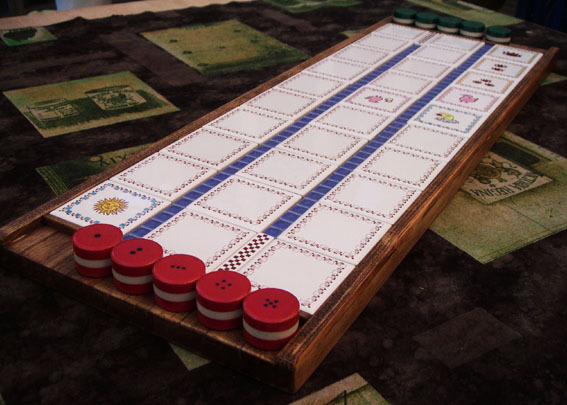 The first player is who has own piece on start tile (sun). 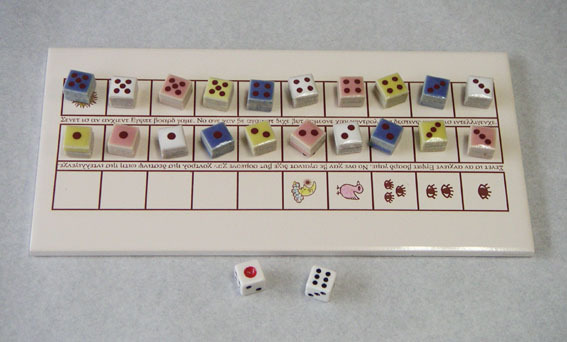 At his/her turn he/she throw 2 dice. 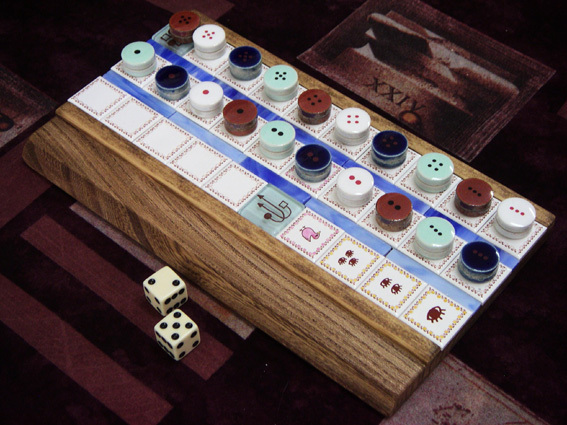 He can select that any 1 piece to move with sum number of dice or any 2 pieces to move each number of dice. 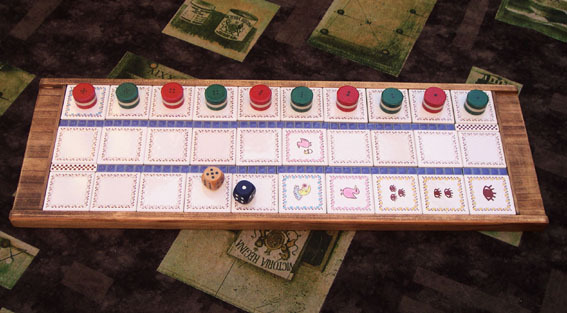 He/she can't move a piece to the square where own piece occupied. But he can move it where opponent piece occupied. 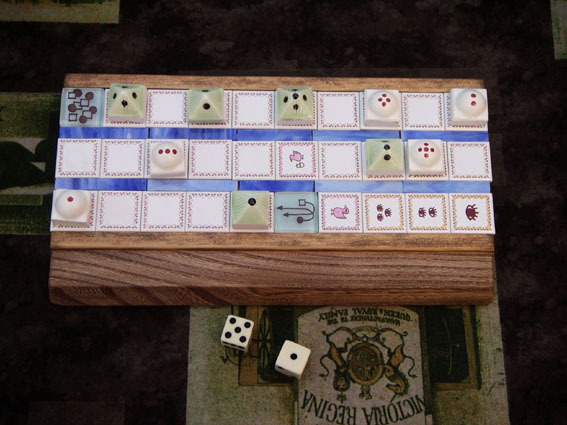 And that opponent piece must go back to start square tile (sun). 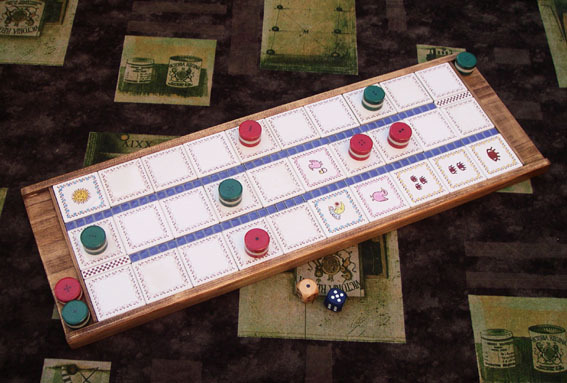 When it is back if some piece is on start square, the piece on start square must be taken out from board. It is unavailable the game after. 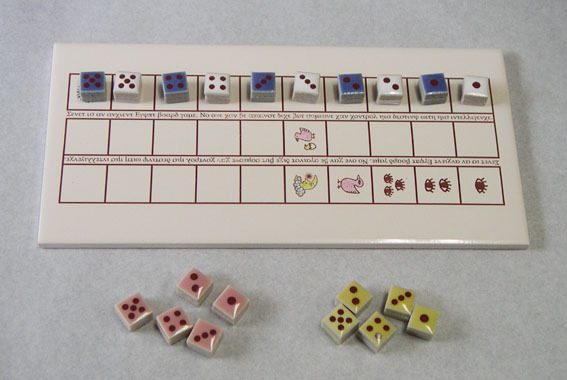 Piece(s) will be up to the goal with just number of die(s). If it isn't just, odd number of moves go back return. Upped piece's dot(s) number is score. 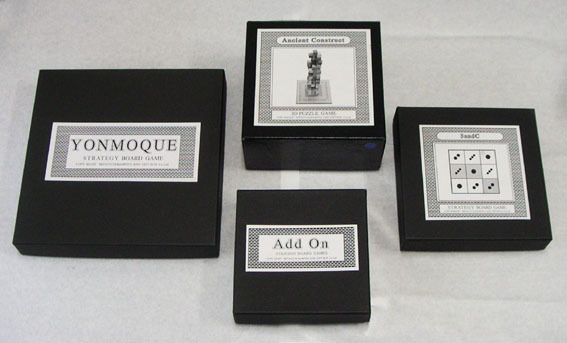 Last 5 tiles are special effect squares. 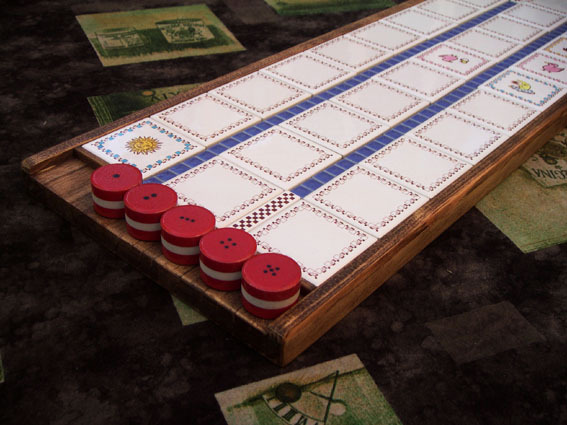 If the piece stops on the last 5th tile (moon), it must go back to start tile (sun). 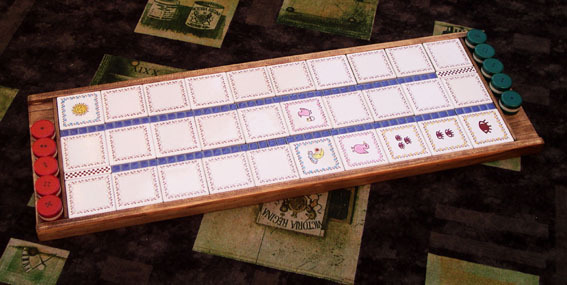 If the piece stops on the last 4th tile (bird), it must go back to 15th tile (bird's birth). Last 3rd, 2nd and 1st tiles are safe tiles to go up. Other piece(s) out of special effect tiles can't be moved to the piece(s) on special effect tile(s). 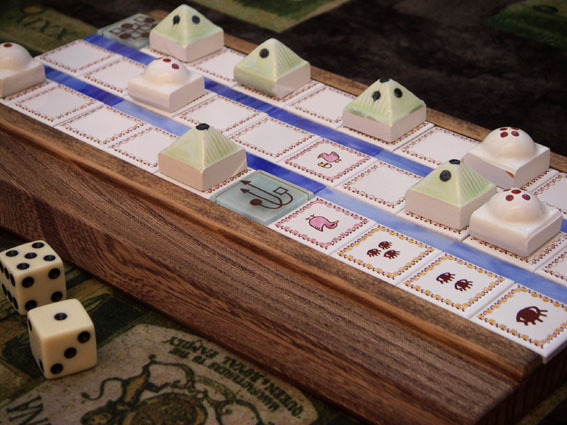 But piece(s) on special effect tile(s) must be moved by next take turn. 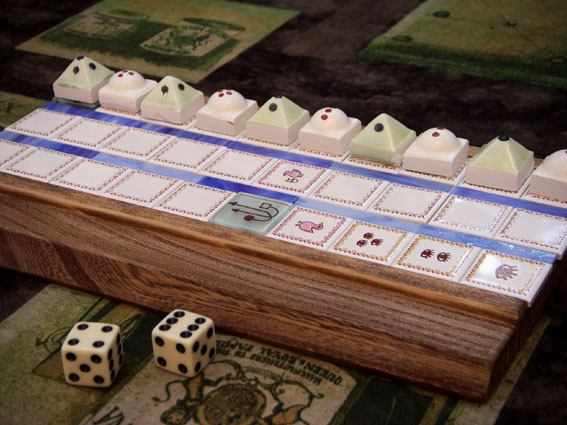 Piece(s) on special effect tile(s) is moved to opponent piece(s) on special effect tile(s). 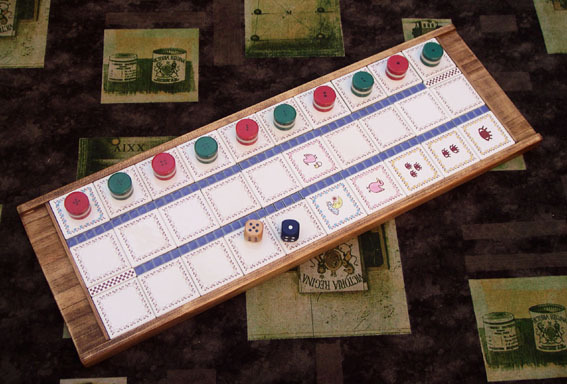 When player has only one alive piece on the board, he can select 1 die throw or 2 dice throw. 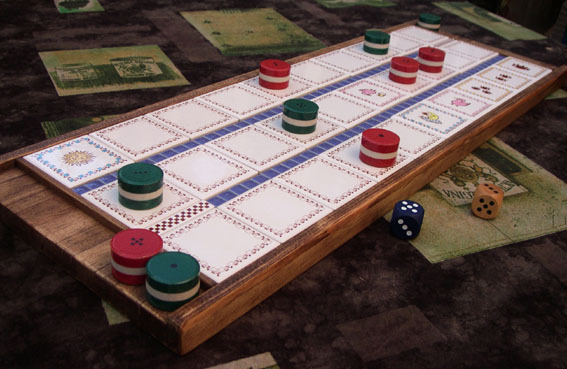 No one can pass the take, the player can’t move own pieces on the board is looser. The winner is the player who get more score when 3 pieces are up. When scores are same, player who has more upped pieces wins. 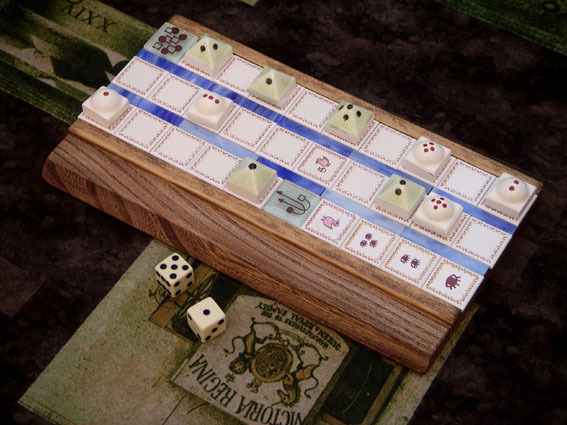 In case of 3 or 4 players, when score and pieces are even, player who made first up wins. 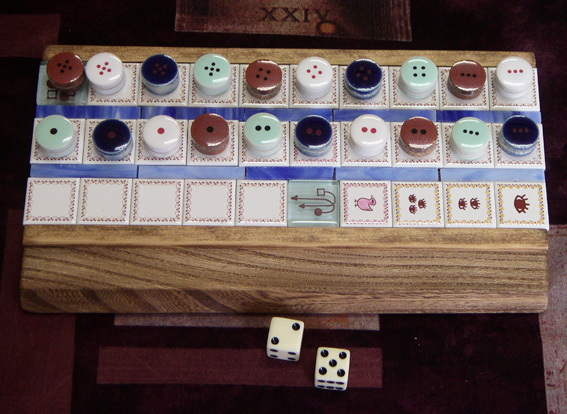 Pieces are Itarian craft tiles.